BingaraLatest NewsThe Living ClassroomAlex is ready to start digging! Alex is ready to start digging! Artist Alex Wisser from Kandos has started his Bingara project. His task is to dig a hole, all by hand, three metres into the earth, and to film every stage of his endeavour. Alex is a key member of the Kandos School of Cultural Adaptation. Along with his fellow artists they are part of the “An artist, a farmer and a scientist walk into a bar …” project being shared with the Bingara community with many activities centred on The Living Classroom. Alex Wisser commencing his dig at The Living Classroom. Launched in early May this year, and continuing on through to November 2019, the “AFS” project seeks to bring together artists, farmers and scientists to share common ground and see how they can view the world through each other’s eyes. Alex, and his artist partner Georgie, along with fellow artists, Laura Fisher, Jono Bolitho and scientists, Ruy Anaya de la Rosa and Alicia Boyd will be spending some time at The Living Classroom in June and July, exploring their various fields of interest, and engaging with local people. Alex’s artistic dig will take him deep below the surface of the ground to see how the top layers of the Earth change with depth. 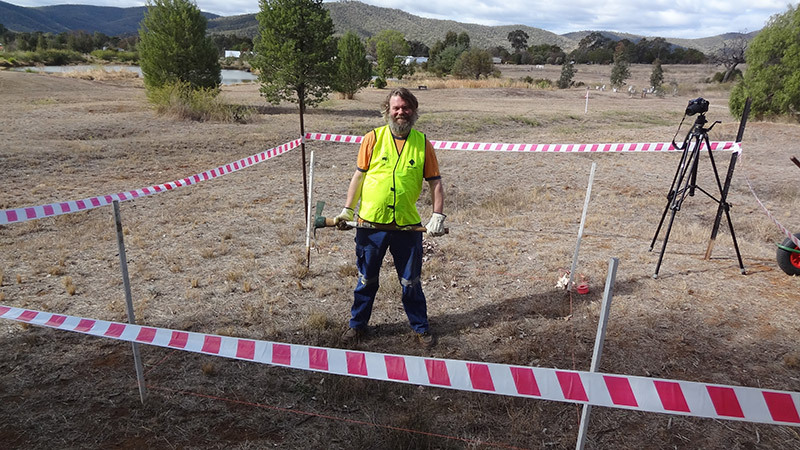 The site chosen for the hole is in the middle of the old gold diggings at TLC so it will not surprise if Alex gets to ‘see a few specks of gold’ as he digs. He might even ‘strike pay dirt’! Once completed the plan is to place a metal and timber form work into the hole and to make it a feature of the site enabling visitors to lower themselves into the hole to experience the diggings. Next Sunday, June 24 the Kandos team along with some local Gwydir partners will be conducting a workshop at The Living Classroom. It is titled “Carbon Science : Carbon Culture” and it will examine the role of carbon on our planet. Everything from carbon in the air, to carbon in plants and carbon from fire, the day will provide a lot of fun and learning. All are welcome to come along from 10 am to 3 pm. The cost is $20 and soup and damper, tea and coffee will be provided. You can see the progress of Alex’s hole, do some charcoal drawing, join in the making of biochar and learn about the amazing element Carbon. Without it we have no food and agriculture but with too much of it in our atmosphere we face inevitable climate change. On Monday June 25 students from Bingara Central School will come to TLC for their personal experience of the Carbon story. Submitted by Rick Hutton – CEO The Gwydir Learning Region.